Disclosure: "This post contains affiliate links, which means that if you click on one of the product links, I'll get a small commision to keep this blog running. All opionions shared are my own." I admit: the idea of adding coffee to my ribs did sound rather strange to me! Apparently in southern American kitchen it belongs to a cooking tradition! It made me curious enough to try this recipe and got blown away by the taste. Especially the ground dark roast coffee in the following rub caused a well balanced palet of flavours. Intested in buying the book after reading this recipe? Buy your version of Best Ribs Ever over here. No pictures inside the book and only available in english but it’s really cheap (too cheap for it’s quality but ssstt don’t tell him). I bet you see this one coming… Mix these ingredients by hand and break up the lumps if present. You should taste this rub dry! 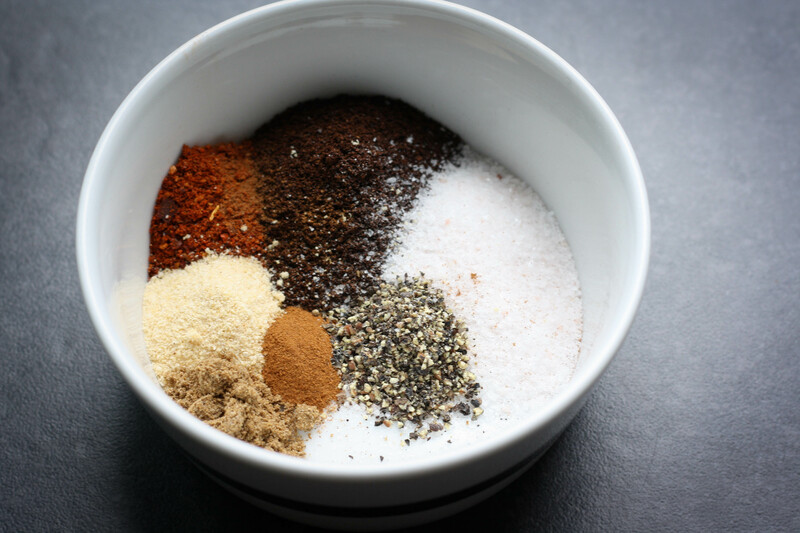 It’s surprising how well-balanced this rub tastes! Before you start rubbing the ribs check if the membrane at the back of the ribs has been removed. If not start by doing this! How? Place a knife under the membrane and carefully remove the membrane with a paper towel. 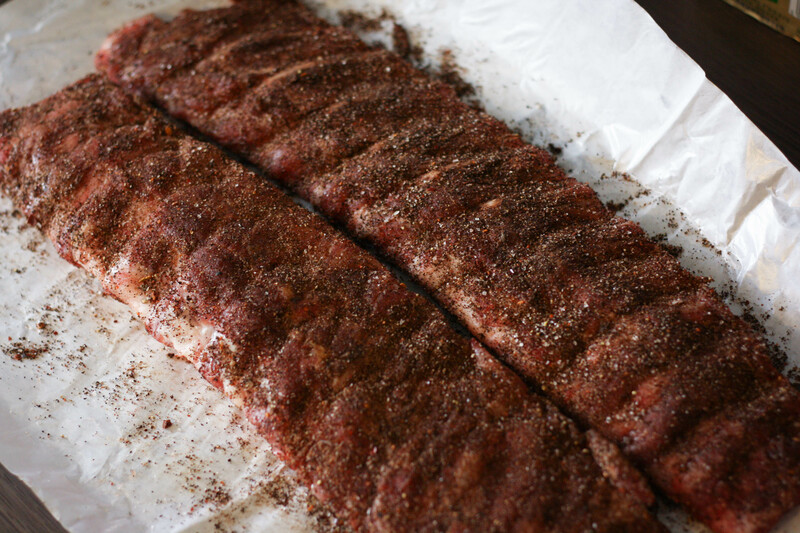 Spread the rub evenly over your Babyback Ribs and put them aside for at least 4 hrs. This leaves you with lots of time to prepare the “incredible Café au lait Sauce”. 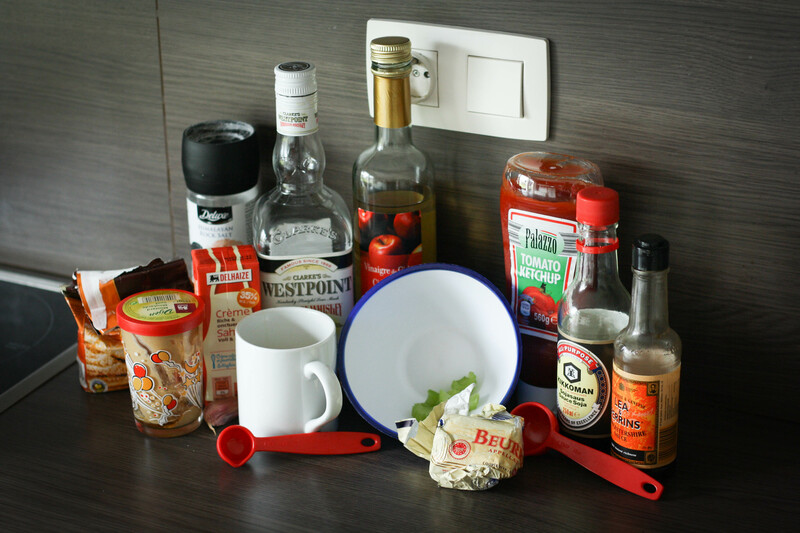 Now don’t start to hesitate when looking at the following list of ingredients. You really won’t complain! And? Still on board? Believe me! You must try this sauce! In this part of the proces I started doubting about what I was doing… Mixing these ingredients looked rather disgusting in the beginning. But luckily I persevered. The original recipe contains liquid smoke but I removed it from the list! 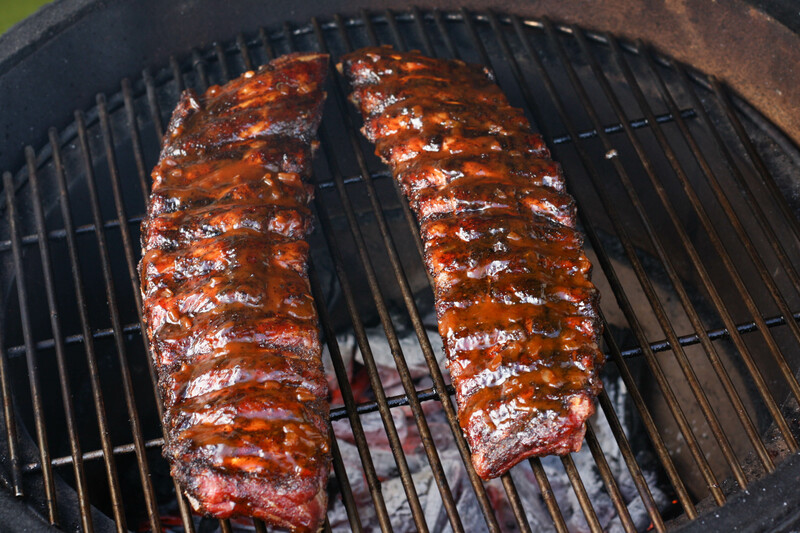 Since you’re smoking the red eye ribs, it’s not a big deal to smoke the sauce itself! First you start by melting the butter on a moderate heat level. Once the butter melted toss in the chopped shallots, garlic and celery and let them simmer for a few minutes until light brown. Add the rest of the ingredients and gradually raise the fire until the sauce begins to boil. Add some smoking chips to the fire (I used Jack Daniels smoking chips) and smoke the sauce for +- 15 minutes at 150°C. I smoked the sauce along with the ribs. Usually I prepare baby back ribs with the 2-2-1 method (old blog site come back afterwards or you’ll be missing the action) to get some fall of the bone ribs! 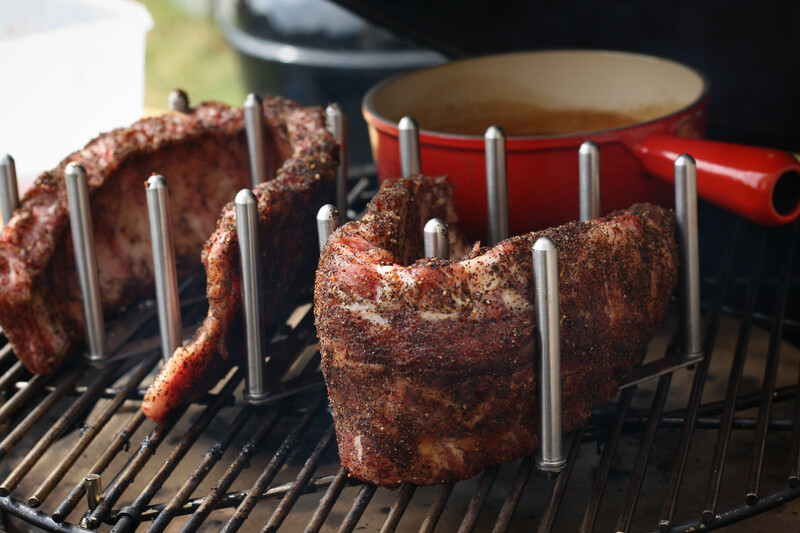 I was always convinced this way was the best way to prepare ribs. Steven Raichlin politely asks to give his way a chance… So that’s what I did! After all he is the face of the BBQ University! This means I smoked the ribs over indirect heat at 150°C (325°F) for 1h15 minutes. 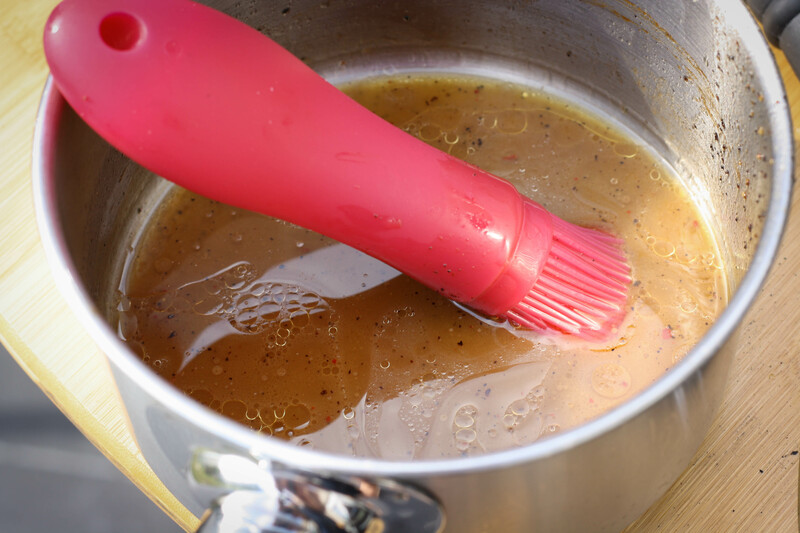 Once you’ve placed the ribs on the BBQ or smoker you can start making the Mop Sauce. Melt the butter and add the other ingredients. Let them simmer for about a minute while whisking the sauce. This mop sauce really tasted sour and bitter! I couldn’t resist adding 2 Tbsp. of brown sugar to compensate these extreme flavours! I don’t regret my decision. After 45 min. you can start brushing the ribs on both sides with the mop sauce you made! I was getting curious by now so I pulled a little piece of the meat and realised how good the rub tasted on the meat! I was longing to taste the entire dish by now! But I still had some time since I was watching the Tour de France while preparing the ribs (not a bad combination). I mopped the ribs every 10 minutes and removed them after a total time of 1,15 hrs. This is the last stage of the preparation. 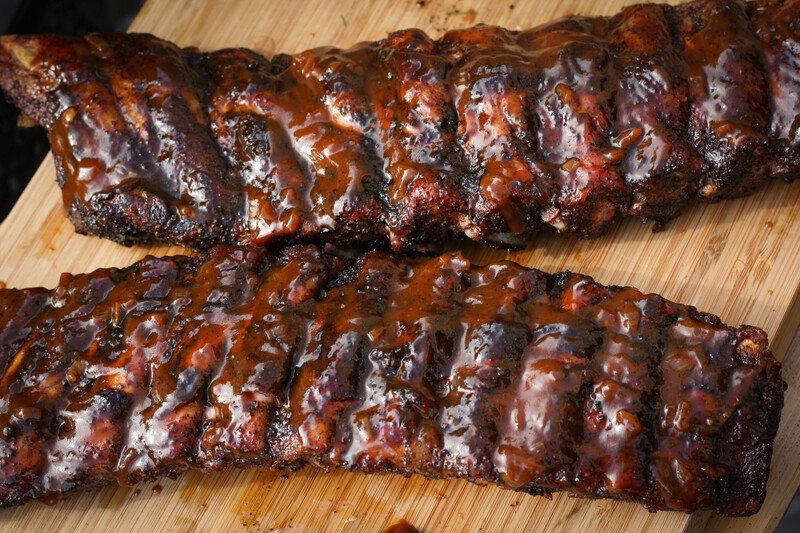 Glaze the ribs with the “Café au lait BBQ sauce” and put them back over direct fire for 2m. each side. The BBQ sauce should sizzle if you’re doing right. The Baby Backs are ready to serve now! I made the Fennel Slaw described in the book but wasn’t really convinced about the recipe… Personnaly I think my Fennel Slaw contains more balanced flavours. But who cares?! The red eye ribs were way to tasteful to complain about the vegetables… Awesome introduction to what I believe is a great book! It won’t take long before I try some other recipes. Liked this blogpost? Maybe you’ll like some of my own recipes to. Feel free to check them on the recipe page. Please share your own experiences, comments or favorite recipes in comment below. Disclosure: "This post contains affiliate links, which means that if you click on one of the product links, I’ll receive a small commision by bol.com. This money is used to keep this blog running. I have no intend promoting products I don't believe in. Any opinion shared over here is my own.